BRADENTON, Fla. — It’s a picturesque, 81-degree day off the coast of the Gulf of Mexico at Bradenton Beach. On a Friday morning in the middle of May, the IMG Academy football team usually is 8 miles east back on campus logging a spring practice. But on this day, IMG players get a chance to enjoy the postcard-worthy weather on the white sand beaches (players actually hoisted IMG coach Kevin Wright in the locker room when he told them that practice was replaced with a beach day). Away from the typical flood of college coaches and reporters, dozens of IMG players share a couple hours of goofing around in the Florida sun. Two of those players are IMG running backs Trey Sanders and Noah Cain. Near the end of the morning, both make their way over to a picnic bench in shaded area to chat with a visiting reporter. Even on beach day, Cain and Sanders can’t escape the hoopla. They don’t mind. They’re well-versed in sharing the spotlight together on and off the field. In fact, they prefer it. At the time, Cain and Sanders were ranked as the top 2019 running back recruits in America, according to the 247sports composite (Cain since fell to No. 4 and Sanders is still No. 1). No two running backs from the same state have ever finished 1-2 in the 247sports rankings era, much less two from the same backfield. Despite their shared workload, virtually every college in America is after Cain and Sanders. They know that. They also know that there’s an obvious question surrounding their situation. Why are two of the nation’s top running back recruits so willing to split carries and share the spotlight? Believe it or not, Cain and Sanders didn’t come to Bradenton for the easy access to the beach, nor did they leave home to get next-level attention. Sanders came to IMG from Port St. Joe, Fla., a Panhandle community that has its own beaches off the Gulf of Mexico. He also had a reputation as one of the country’s top recruits after rushing for more than 1,000 rushing yards and earning Florida all-state honors as a freshman. Oh, and he already committed to Alabama by the time he left Port St. Joe in the summer before his sophomore year. At the time, Sanders’ focus was to get more work at IMG. He said that he never got more than 8 carries in a game at Port. St. Joe. 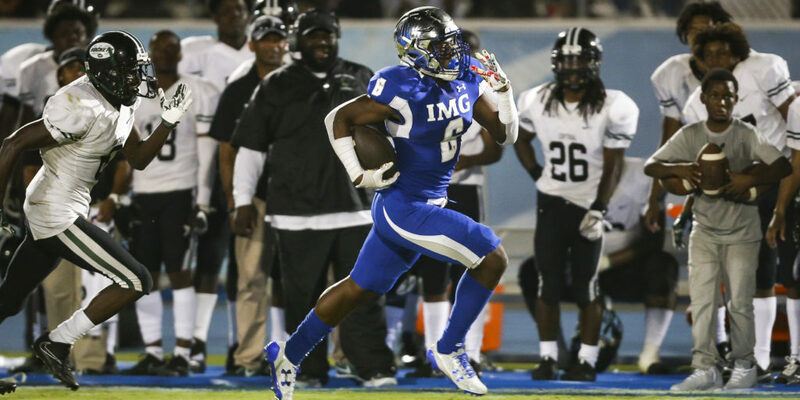 For the first 2 months of his sophomore season at IMG, Sanders never got more than 8 carries in a game, either. That was because of an ankle injury and a move to safety. But when Sanders was finally healthy in late October against Long Beach Poly, he went off playing his natural position. He needed only 17 carries to rack up 197 yards. “That’s when I thought (Trey) had a chance to be special,” IMG coach Kevin Wright told SDS. As special as Sanders was late in the season — he finished his sophomore year averaging 9.6 yards per carry — he soon got plenty of company in the IMG backfield. Blue-chip California running back and future Oklahoma signee T.J. Pledger announced his plans to transfer to IMG. A few months later, Cain went public with his decision to leave Texas for Bradenton. There were plenty of skeptics about Cain’s decision to join an already-loaded backfield. “People were like, ‘Why would you go out there with Trey and T.J. Pledger?’” Cain said. “It really wasn’t about stats for me. It was about me getting better. I knew what my projection could be. I had to keep my body healthy. That’s the biggest thing to get ready for college. I saw an opportunity for me to really understand the college atmosphere and environment because I’d rather compete now and deal with adversity now than do it in college. Spend 5 minutes with Cain and it’s not hard to see how serious he is about the long-term approach. Wright loves to tell the story about when IMG hosted a 7-on-7 camp a few summers ago and Cain walked into his office with his dad. At the time, Cain had just finished his freshman season at Denton Guyer High School (Texas). That didn’t stop Cain from handing Wright a printed copy of his résumé. To Wright’s amazement, it wasn’t loaded with many football accomplishments. Instead, Cain wanted to make his case for why he belonged at IMG because of his work in the classroom and in the community. The big-picture mindset allows Cain to be patient in a crowded backfield. It’s also what opened the door for him and Sanders to become each other’s biggest fans instead of biggest rivals. It didn’t hurt that they also got the perfect coach to preach that message. Sanders enjoys when he gets a front-row seat to watch Cain work. Cain’s ability to keep his legs moving is why he’s a load to take down at 209 pounds. Sanders admits he “never had a running back beside him who could carry a whole pile” until he saw Cain do it. During a game in Utah in 2017, Sanders remembered Cain basically giving a defender a piggy-back ride. Sanders’ style is different than Cain’s 1-cut-and-go. According to Cain, the bigger Sanders (5-11, 216) is more like a Le’Veon Bell-type — shifty, patient and explosive at the second level. There’s another interesting comp for Sanders. IMG running backs coach Carnell “Cadillac” Williams sees some of his old Auburn running mate Ronnie Brown in Sanders. It’s perhaps not a coincidence that Wright brought Williams on board to coach the IMG running backs in the summer of 2017. After all, who would know about thriving in a crowded backfield better than Williams? He and Brown formed arguably the greatest running back duo in SEC history. “I couldn’t think of a better running backs coach to have,” Sanders said of Williams. With Pledger off to Oklahoma this year, Cain and Sanders will be more of a duo than ever as seniors. Williams has plenty of memories of when he found himself in a shared backfield with Brown when they were seniors (people forget that Brandon Jacobs left Auburn for Southern Illinois when Brown and Williams surprisingly announced their return for their senior seasons). Fourteen years ago, Brown and Williams made history by fueling Auburn to a perfect 13-0 season. They made even more history when they became the first backfield duo to ever get picked in the top 5 of the same NFL Draft. Williams sees the potential with Cain and Sanders to carve out their own path to history. “He pulls us aside and tells us that we’ve got an opportunity to do something special that’s never been done,” Cain said. When Williams arrived, he expected to deal with some massive egos. What he found was not only did Cain and Sanders not have any sense of workload entitlement, they actually liked that they could preserve their bodies for the next level. They didn’t get hung up on the fact that Wright envisioned roughly 12-15 carries per game for them, and that there really wasn’t an “RB1.” If it helped them prepare for college and the NFL, Cain and Sanders were on board. Williams was also worried that Cain and Sanders wouldn’t like each other. Quickly, he learned that wasn’t the case. They were inseparable. Before Cain got to IMG, he talked to Sanders on the phone and they hit it off. Their personalities are different — Cain is a bit quieter and Sanders is more outspoken — though that didn’t stop them from becoming fast friends. They roomed together on the road, which only added to their bond. But like all close friends, they do have a pet peeve of one another. When Sanders is craving noodles at 10 p.m. and he needs to borrow a hot plate, it’s Cain’s door that he’s knocking on (whether Cain is asleep or not). Cain draws the line when it comes to sharing food. Sometimes he’ll get a 3-piece spicy chicken meal from Popeyes before a game, but he’s not about to share any of it with Sanders. “That kinda makes me mad, though,” Sanders joked. For as much time as they spend together, those were the lone gripes they had about their situation. Williams said he’s never heard either complain about playing time. When one scores, the other is the first one to congratulate them. Liking each other off the field makes it that much easier to coexist in their unique circumstance on the field. 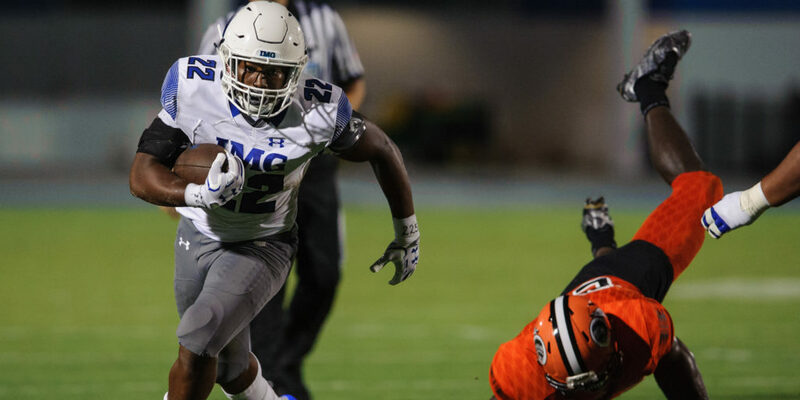 It’s no longer a question of whether Cain and Sanders will put their egos aside and trust the multi-running back process at IMG. They bought into that a long time ago. There are, however, a few questions that remain. The big one — and the one that fans across the country probably want to know — is where they’ll play their college ball. They certainly have options. Sanders was committed to Alabama for nearly 2 years, but he dropped his commitment this past New Year’s Day. He took unofficial visits to the likes of Florida, Florida State, Georgia, Miami and more will probably come for the 5-star tailback. Cain unofficially visited a wealth of schools, including Auburn, Clemson, Florida, LSU, Michigan, Ohio State, Oklahoma, Penn State. In other words, there’s a lot left to be decided in their respective nation-wide recruitments. Who knows? Maybe Cain and Sanders will join the same college backfield and go on to become top-5 picks in the NFL draft together. The other unknown is whether Cain and Sanders will finish their careers as the first running back duo to be ranked No. 1 and No. 2 in the 247sports composite. 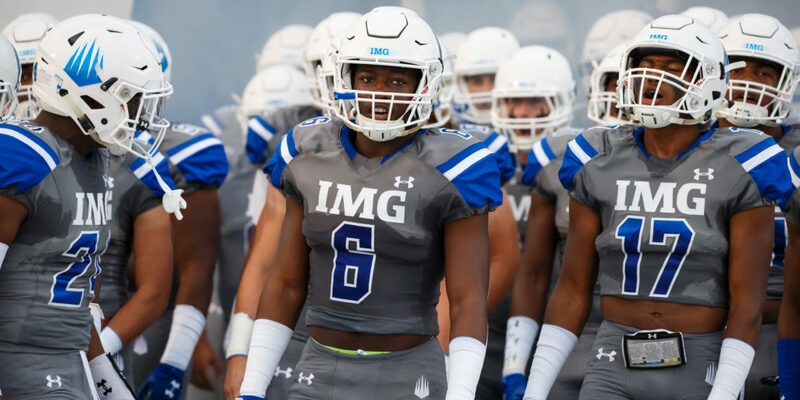 For a couple of guys who came to IMG not worried about numbers, does being considered the greatest duo of high school running back prospects ever really matter? Sanders admitted that if and when Cain go their separate ways, he’ll miss having that connection they formed. It’s one neither take for granted. They could have gone a different route in their high school careers. It would have been easy to rack up monster numbers piling on hundreds and hundreds of carries against inferior competition. Instead, they’ll enter college having gone through a high school experience that forced them to be disciplined, efficient and ultimately, unselfish. They won’t have the wear and tear on their bodies that other high school running backs will have. Cain and Sanders have plenty of time to rack up the miles. And if history is any indication, they won’t have any issues getting to the next level and showing an extra burst. Ronnie Brown and Cadillac Williams are not the no. 1 running back duo in CFB history. Nick Chubb and Sony Michel hold the record for the most combined yards by a duo. In addition, they compiled those yards with Chubb out for half of his sophomore season and Michel out for the latter half of his freshman season. In addition-addition, they shared their freshman season with Todd Gurley for half of it. Gurley was well on track to win the Heisman that year until he was stupid and got suspended for a surprisingly long period of time. Carrer stats: Nick Chubb has the 2nd most career yards in SEC history, Michel has the 16th most. Season stats: They both have multiple individual 1,000 yard rushing seasons: 2 for Michel, 3 for Chubb. 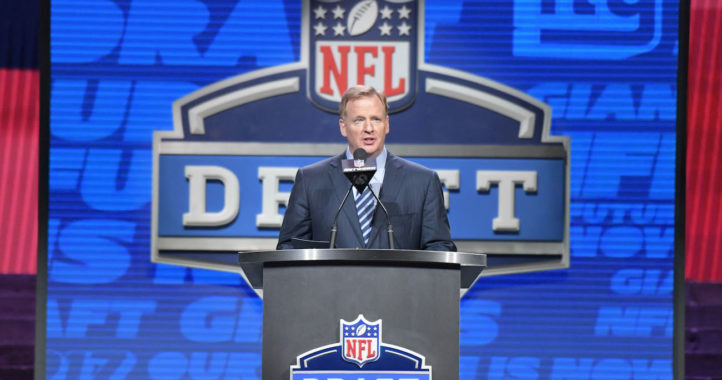 Draft positions: Michel was a 1st round, Chubb was 4 picks away from also being a 1st round pick. Eye test: I have no idea how or who judges that. There are not 75 college RB duos who even attempt to argue for the best of all time. Finally, wasn’t there a Florida duo that was very good back in the day? P.S. No duh I’m going to defend Michel and Chubb. You must be 10 years old. Well then, could you please submit your argument for Brown and Williams above Chubb and Michel? Age accusations and name calling, while temporarily distracting from the topic at hand, don’t do the best job of using statistics to defend your case. Did you just show up? There was an entire article and conversation on this topic about a month ago….. You can still look it up. I read the article when it first came out. My argument against Auburn’s star duo is that they really only had one major breakout season together, in 2004. If you put that 2004 season against Chubb & Michel’s 2017 season, then I personally feel (backed by my bias, obviously) that the Georgia duo has the upper hand. I mainly feel that Chubb & Michel take the prize of top CFB RB duo because of what they accumulated over their entire career amidst a coaching change and three years of first-year starting QBs. 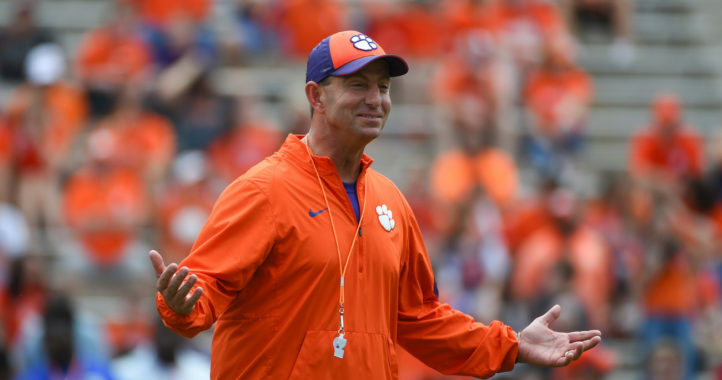 It really doesn’t matter what you think Kirby…..the fact is if your tandem of backfield was so great where is the National Title? At least the Auburn duo went 13-0 and were robbed of the National Title because of petty football politics. This is incorrect. In the 1960 NFL draft, Billy Cannon of LSU was drafted #1 and Johnny Robinson of LSU was the #3 pick. Both were running backs. Both chose to sign instead with the new AFL, but that doesn’t change where the NFL drafted them. Now this was the era of one platoon football, and both played both offense and defense. So their statistics are far different from the current era. But both starred in the AFL, and eventually played in the NFL when the leagues were merged. Robinson started playing as a running back, but later switched to defense and starred as a safety. Some say he redefined. Just some correct history from someone who watched them play both at LSU and in the AFL. Robinson started playing as a running back, but later switched to defense and starred as a safety. Some say he redefined the position.